Typography geek? If you like the geometry and mathematics of these posters, you may enjoy something more letter ed. Visions of type: Type Peep Show: The Private Curves of Letters posters. This section contains various art work based on `\pi`, `\phi` and `e` that I created over the years. `pi` day and `pi` approximation day artwork is kept separate. 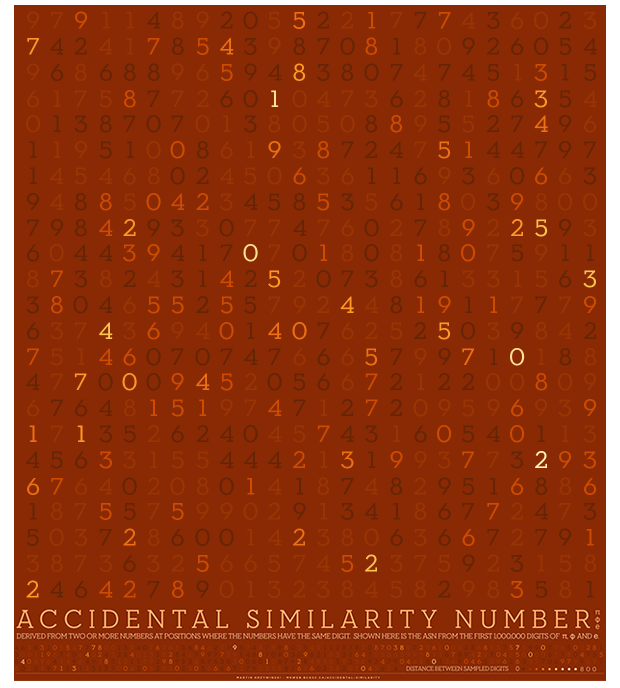 The accidental similarity number (ASN) is a kind of overlap between numbers. I came up with this concept after creating typographical art about the `i`-ness of `\pi`. The poster shows the accidental similarity number for `\pi`, `\phi` and `e`.